Let your Costa Rican Adventure continue... from your comfortable base in at Hotel Casa Roland in San Jose, it is just a short trip to some of the most spectacular fun-filled destinations in the world  Costa Rica's Beaches, Volcanoes and Rainforests. Below are just some of the options we can present to you and invite you to enjoy... and other links to great resources that will help you plan your dream vacation in Costa Rica! Manuel Antonio National Park, lying on the pacific coast 7 kilometers south of the town of Quepos, was created in 1972 and is one of Costa Rica's most spectacular attractions. Manuel Antonio National Park is one of the most stunning, picturesque adventure destinations in the country. This is one of the most verdant places in Costa Rica, with spectacular white-grey sand beaches ringed by thickly forested green hills. The Manuel Antonio area offers fantastic recreational opportunities... You'll find a huge variety of things to do - walking the Park's easy trails, whitewater rafting, ocean cruising, horseback riding, fishing, sea kayaking, to name but a few. Villas Lirio is located in the Quepos/Manuel Antonio area. Our secluded hotel is adorned with native tropical plants, creating an inviting, relaxing atmosphere perfect for relaxation and rejuvination. With 21 exceptional rooms and suites to choose from, as well as the peresonal attention of our friendly English/Spanish speaking staff, your stay with us is guaranteed to be a memorable one. J ungle Al's is located at the edge of the incredible Corcovado National Park on Souhtern Costa Rica's Osa Penninsula. A stay at Jungle Al’s sport fishing resort combines a tropical beach vacation with the spectacular ecology of Costa Rica's jewel of tropical lowland rainforest. 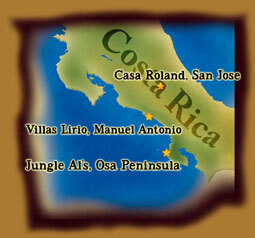 Jungle Al's offers all inclusive packages for traveling and staying in Costa Rica. Jungle Al's offers both luxury villas and rustic Cabinas. Jungle Al's provides multi-day sport-fishing tour packages. Parrot Bay Village is a full service Costa Rican Beach & Nature resort offering state of the art Sport fishing as well as nature and adventure tours. It is conveniently located just outside of the small beach town of Puerto Jimenez , Osa Peninsula , Costa Rica . The eight private cabinas are centered within an exotic botanical garden in a mangrove lagoon with views of the Ocean. Wildlife is abundant with various species of monkeys, Iguanas, Scarlet Macaws, Toucans, and other exotic birds. There is a safe swimming beach right outside your bungalow with warm and calm waters. An open-air restaurant and bar offers tropical breakfast, lunch and international cuisine for dinner. Casa Roland Hotel Group's Avalon Hotel  Blue Fox Bar & Ballroom & the Jungle Sport Park will be the perfect gateway for tours of the Corcovado National Park. Our Hotel will have 30 spacious rooms, suites and bungalows, built on the historic "Zona Americana" in Golfito. Discover virtually untouched beaches and virgin forests, a sportfishing paradise and one of the world's most diverse ecological systems.